As a rabbi I’ve always tried to stay away from politics. In my sermons and even in private discussions with students I generally refrain from sharing my own personnel opinion on political issues. But I draw the line when issues of morality and ethics are raised and the media’s coverage on the current war between Israel and Hamas has moved this issue from politics to morality. Again and again, Israel is accused of human rights violations, of acting disproportionately in their bombing of Gaza and of being insensitive to the plight of innocent Palestinians caught in the middle. Since the issue has been reframed as a matter of right and wrong, we the Jewish people, who have introduced so much morality and ethics to the world, must respond to these allegations of immorality, even at the expense of pointing out the obvious. To me and maybe to you as well, much of what I say may be obvious but I believe still important to be said. Charge: Israel is just as morally responsible for this “cycle of violence” as is Hamas. Response: When it comes to morality it matters who attacks first as the object of the initial aggression has the moral right to self-defense. To be clear, this war began with the kidnapping of three Jewish boys coming home from school. In an effort to find the boys and bring them to safety Israel arrested many of Hamas’ leaders. Hamas responded by firing rockets into Israel, which was then followed by Israeli air strikes on terrorist positions to stop the rocket attacks on Israel. The media speaks of a “cycle of violence” but every cycle has a beginning. And this one clearly started with Hamas. Charge: Israel’s immoral occupation of Palestinian territory is ultimately responsible for the current crisis. Response: First, Israel occupied the West Bank and Gaza strip only after winning those territories in a defensive war thrust upon Israel and therefore the whole question as to who is morally or legally entitled to these lands is not simple. However, for the purposes of this war, the issue of occupation is irrelevant since Israel pulled out of Gaza and handed it over to the Palestinian people. The world has somehow forgotten the painful evacuation of close to 8000 Jews who were living in Gaza. And so the claim that the Israeli occupation is ultimately at fault is baseless as Israel no longer controls or occupies Gaza, Hamas does. Charge: Both Israel and the Palestinians cultivate a culture of hate and vengeance as evidenced by the kidnapping and killing by both Israelis and Palestinians of innocent teenagers. Response: There is no moral equivalency between these two heinous crimes since the crime committed by the Israelis is an anomaly denounced by everyone in Israeli society, both by the public and the leaders. Contrast this to the Palestinian kidnappers and killers who continue to receive the praise of their people and leaders. Further, Israel arrested the Israel suspects who await prosecution in a court of law (as they should) whereas the only ones looking to bring the Palestinian suspects to justice is Israel. Palestinian leaders and schools still educate their society and children in Jew hatred while Jewish leaders and teachers do not educate or incite Arab or Palestinian hatred. Charge: Israel’s bombing of Gaza is indiscriminate targeting schools, hospitals and mosques. Response: Israel targets and bombs Hamas and Islamic Jihad terrorists and their rocket launching sites. It does nottarget innocent civilians. It is well documented that Hamas has purposely placed rocket launching facilities under schools, mosques and hospitals using the children, patients or worshipers in those locations as human shields. If Israel wanted to kill civilians it could have killed hundreds of thousands but it has no such desire which is further evidenced by the IDF’s sending of leaflets and making phone calls to clear out as many innocent civilians as possible when targeting a rocket facility or a terrorist. Contrast this to Hamas’s rocket attacks which specifically target Israeli population centers. As Israeli Prime Minister Benjamin Netanyahu remarked: “We are using missile defense to protect our civilians and they’re using their civilians to protect their missiles”. Click here to watch video as IDF Postpones Strikes on Hamas Targets after Identifying Civilians in the Area http://youtu.be/yE7ykidY7FA. Charge: Israel acts in an unjust manner as hundreds of Palestinians have been killed in Israel air strikes compared to virtually no-one on the Israeli side. Response: First, many of those killed are active terrorists and killing them is simple self-defense. Staying on the moral issue, the fact that one side in a conflict loses more lives than the other does not in any way make that side’s cause any more just or correct. Wrong does not simply become right because more people are dying. Of course, on a purely humanitarian basis, everything should be done to put an end to the loss of life but as long as Hamas keeps raining down rockets on Israel what else should Israel do? What would any country do to protect themselves? Anything short of continuing to bomb Hamas’ rocket facilities and those operating them would be unethical as a government’s first and primary moral responsibility to its people is to protect them from external threats. In short, Israel acts in a morally upright manner and Hamas is the villain. We should not shy away from sharing these ideas with our colleagues and associates, many of whom are being fed lies and propaganda through the mainstream media. If they don’t hear these facts and ideas from us they very well may not hear them at all. We have good reason to continue to be proud of our beloved Israel. She is handling a very difficult situation with grace, dignity and bravery and above all morally. There are no words to describe the utter sense of sadness, loss and outrage we all feel on behalf of the Shaar, Frenkel and Yifrach families. What these families have been put through is indescribable and the dignity and grace with which they have confronted this tragedy is nothing short of inspirational. Last week I participated in a rabbinic conference call with Racheli Frankel, mother of Naphtali z”l who told us that the sense of Achdut (unity) and Ahavat Yisrael (love of one Jew for the next) were “not just clichés” but something she was truly feeling from Jews all over the world and something she asked us rabbis to continue to promote here in the United States. She wanted something good to come of this terrible situation and I feel we owe her at least that. Racheli said she felt tremendous love and support from all segments of society, from the Charedim (ultra-orthodox) and their prayer gatherings to the Chilunim (secular). Yair Lapid, Israel’s Finance Minister went to visit the families in an article was quoted as saying to the mothers: “I haven’t prayed in six years. I haven’t gone into a synagogue since my son’s bar mitzvah. When I heard what had happened to your sons, I turned my house upside down to look for my grandfather’s prayer book. I sat down and prayed.” Interior Minister Gideon Sa’ar said that because of what was happening he was going to begin observing Shabbat and publicly said he would not answer his phone until the stars come out on Saturday night. President Shimon Peres said and I quote: “three families like this can lift up a nation to heights previously unknown and I’m not exaggerating. It’s been several days that Israel has been different, unified, joined, praying, fighting”. 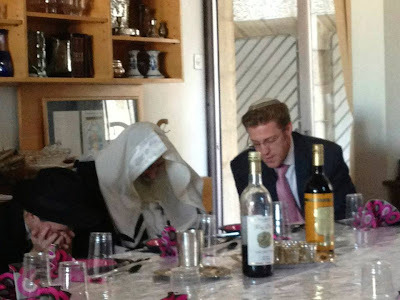 One of the other mothers (Bat-Galim) said that a chatan, a groom came to her home on the morning of his wedding to encourage them and Racheli referenced a large prayer gathering in Talmon organized by both the Ashkenazi and Sephardic Chief Rabbis of Israel. She ended the conference call with her prayer that the current sense of unity should serve as a tikkun, as a spiritual rectification for the divisiveness spoken of in that weeks’ Torah portion, Parshat Korach. And so in our sadness and outrage we shouldn’t lose the sense of love and unity that was somehow brought about and which is so often missing from our community. proud: our love for life and basic sense of humanity. Could you ever imagine a Jew celebrating the abduction and murder of a child, even one from our enemy? It’s unheard of in the Jewish community because ultimately Judaism celebrates life. The Torah is a guidebook to filling our lives with meaning and purpose. By celebrating the kidnapping and murder of innocent children our enemy has shown their true colors and demonstrated that the God they worship is not a God of life and love but one of hatred and death. Ultimately this is a tragedy of immense proportion and the Jewish people will never be the same without our three boys. But the way these brave families and Jews from all over the world have reacted to this huge blow only strengthens the treasured Jewish values of unity and love for life. May our continuing to celebrate life through Torah serve to elevate the souls of Eyal, Naftali and Gilad, zichonam livracha. May their memory be a blessing and may their families be comforted amongst all the mourners of Zion and Jerusalem. In an article recently printed in a pro-Kremlin newspaper, Andranik Migranyan, head of a pro-Russian organization here in Manhattan, suggested that had Hitler stopped in 1939 he would be considered a “good Hitler”. “One should distinguish the difference Hitler before 1939 and Hitler after 1939” said Mr. Migranyan who argues that if Hitler had stopped after the “bloodless” reunification of German lands “he would have gone down in the history of his country as a politician of the highest order”. How Mr. Migranyan could make such a statement despite the fact that by this time Hitler had already organized Dachau (the first concentration camp), Kristallnacht, and carried out dozens of Nuremberg racial laws, is beyond me. My own grandfather, Max Schoenwalter who lived with his family in Germany received a letter from the Nazi Government informing him that his paint company was to be liquidated and Judenrein or “Jew free”. That letter was sent to him in January of 1938. But an even deeper question arises: Why would a Russian, representing the current Russian government make such a statement? The Soviet Union lost more than 20 million people fighting the Germans during the Second World War. Communists despise Fascists. How could Migranyan say this? The reality is that until Germany attacked Russia, the Soviets were largely unaffected by what the Nazis were doing to Jews and other groups they deemed non-Aryan. It wasn’t until the Nazis invaded Russia that the Soviet Union was impacted by Fascism. And so liquidating people’s businesses, implementing discriminatory laws, instigating pogroms and sending Jews to concentration camps dosen’t make Hitler a bad person. Only attacking Russia does. The world becomes a very dangerous place when a leader’s morality is evaluated by how he or she treats one people but not by the way they treat another. It may seem obvious but a person can only be deemed ethical if they behave civilly and fairly to all people. Hitler tried to demonstrate that only some people deserve to be treated with dignity but the Jewish Biblical teaching of all people created in the Divine image demands that all humanity, irrespective of race, creed or religion be treated with respect and kindness. And so there was never a “good” Hitler, not even before 1939. It was a Sunday afternoon in July of 2000 and 35 of us were gathered at Kennedy airport for the first ever MJE Trip to Israel. I saw one of the participants standing in a corner of the terminal, a guy in his 20’s w/ a large backpack swung across his shoulder. I went over to introduce myself. I said my name is Mark, I’m one of the Rabbis on the trip. He told me his name was Jonathan and that he had really had very little to do with Jewish life, and that this was his first trip to Israel. Like most of the others on the trip, Jonathan didn’t know a soul when it began. 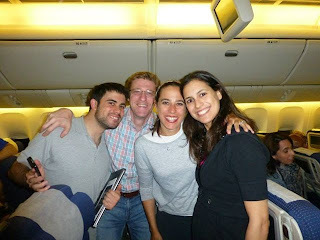 When I caught up with him on the return trip, he told me that felt now not only a phenomenally deep connection with the other members of our group and Israel, but also with Judaism itself. “A deep connection,” I thought to myself, from one trip? Even I was a little skeptical, but when Jonathan returned to NY he started to come around. He began to attend MJE classes, our Beginner’s service on Shabbat, and then very rapidly he became an entrenched part of the MJE community. A year or so later he returned to Israel–this time to study–which he ended up doing for many years until he eventually received simcha from none other than Rabbi Shlomo Riskin, to whom we paid tribute at the Annual Dinner on April 2nd. A few years ago, Jonathan officially made Aliyah, and he now lives in Israel with his wife Dena and their 3 beautiful children. He currently Co-directs the RRG Hillel Beit Midrash program at Hebrew University, reaching out to American students traveling to Israel for their first time just like he himself did back in 2000 on the first MJE trip. So many others from that first trip are today Sabbath-observant and sending their children to Jewish Day schools. I’m just speaking of those from the first MJE trip to Israel. We’ve had many more trips to follow, each and every year w/ over 400 participants in all, all of whom have been powerfully impacted in so many ways. And that, ladies and gentlemen, is why we chose to honor Israel. She is our mentor, our guide, our promised land. She is the mother, the teacher, who reaffirms in all of us what it means to be Jewish, and we carry that with pride. What’s her secret? What’s the magic of Israel? How can just one week in the holy land affect such a dramatic change in people’s lives? I think there are many answers to this question, but the most important one I believe is authenticity. You see to most young Jews growing up in America, Judaism is something like a fairy tale. You hear these stories of a great and glorious past but it’s just ancient history; it’s a relic of the past that for most American Jews has little or no relevance. But that all changes when you go to Israel because when you’re in Israel you don’t hear about Judaism, you experience it. In Israel you don’t just study or read about Jewish history, you see it. You live it. You can travel, as we do each summer, through the famous Tunnel Tours – the tunnels that connect us to thousands of years of our history and place us right next where the holy of holies once stood in the Temple. You can climb Masada and feel connected to our ancestors who fought off the Romans with their last breath. You can sit in Tzipori, at the very place where the Sanhedrin, the Jewish High Court, would sit and adjudicate Torah law. We’ve gone on archeological digs and uncovered pottery dating back to King Solomon’s Temple over 3000 years ago. We’ve travel to Tzfat each summer and visit the synagogues and graves of the very Sages and Kabbalists who composed the prayers we say every Friday night to bring in the Shabbos. We’ve walk in the trenches of Ammunition Hill from where the recapture of Jerusalem began in 1967 and stood in the Golan Heights to see the miracle of Israel’s continued existence against all odds. We’ve visited Israel’s vineyards and wineries, places that have been turned from literal swamps into the most beautiful farmlands and kibbutzin. Rather than just reading about the Temple of old, we pray at the remaining Wall that surrounded it. “Ano dome shemiyah l’reiyah.” The Talmud says, “you can’t compare hearing to seeing.” Seeing is believing, and that’s why Israel is indispensable to the outreach experience. Because Israel is the ultimate authentication of Judaism for the Diaspora Jew. It backs up everything we’ve heard and provides us with evidence for all those stories we listened to growing up. It’s the embodiment of all the “reasons” we were told to be Jewish. When I asked Jonathan what hit him on the trip, he said that for the first time he saw that Judaism wasn’t just a bunch of stories, that it was real. That our people, our land, and our faith are a living and breathing reality, and he wanted to be part of it. And that’s why Israel has been such an important part of our outreach at MJE and the focus of our Dinner. On April 2nd and always we pay Tribute to our beloved Israel and recognize how she has served not only as a safe haven after the Holocaust 70 years ago but how she continues to inspire Jews from all over the world today. We reflect on how Israel reminds all of us of our unique history and of our special connection to Hashem and His Torah. Israel fills us with pride and serves as the greatest evidence for our Jewishness today. If the MJE trips to Israel have accomplished anything, it’s to bring this powerful message: Judaism is real and alive for ourselves and for hundreds of our Jewish brothers and sisters. MJE is proud to be here to help keep that message alive, and we hope to continue spreading it for years and years to come. Last evening I watched Channel 2’s celebration of the 50th anniversary of the Beatles famous debut in America on the Ed Sullivan Show in February of 1964. For me personally the Beatles represent not only my favorite music but an exciting part of my childhood. 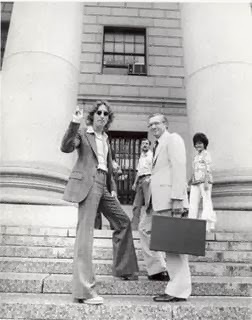 From 1970 to 1975 my father represented John Lennon in deportation proceedings initiated by the United States government during the Nixon administration. Although a legal “reason” was offered by the government it was highly political as John was quite outspoken against Vietnam and had initiated a “Dump Nixon” campaign. In addition the voting age had just dropped to 18, another reason why John’s influence on America’s voting youth could cause problems for the President’s re-election. After a five year battle with the government my father was successful in fighting the deportation and in securing John his green card for permanent residence. On the last day in court my brother and I got to meet the famed ex-Beatle. It was my 8th birthday and after we met John he leaned over and said to me: “Happy Birthday Mark, you can have your father back now”. Although my father was John’s lawyer and friend I was and remain “The Beatle fanatic” in the family. (My father could never give up his love for classical music and my brother still thinks Elvis is the eternal king of Rock and Roll). I absolutely love their music and to this day enjoy learning more and more about each and every song they composed. But how is it that after 50 years so many millions of people still listen to the same music? How is it that the music of The Fab Four continues to sell in a society which prides itself as always changing and moving on to something new? The answer is quite simple: Quality and depth last. Whenever we come across something that has true substance and which reflects something of a deeper dimension, it usually stands the test of time. If our continued interest in the Beatles after five decades demonstrates the quality and depth of their music than what can be said of a tradition which is still appreciated and practiced for several millennium? The quality and depth of our own Judaism must be that much greater. I always wondered how it is that every year we read the same parsha or portion of the Torah and yet it never grows dull. How each and every year we go through the very same stories of the Bible, read the same laws and recite the identical commandments. It’s not as though we expect some new ending to one of the stories or for one of the laws to change and yet our Torah continues to inspire and guide. Why? Because there’s enormous quality and depth to Judaism and when something is so deep it has layers upon layers of wisdom for us to uncover. As we do this each and every week, year after year, we discover greater insights into the world around us and into the human condition within ourselves. And that can last a lifetime. Strawberry Fields Forever. 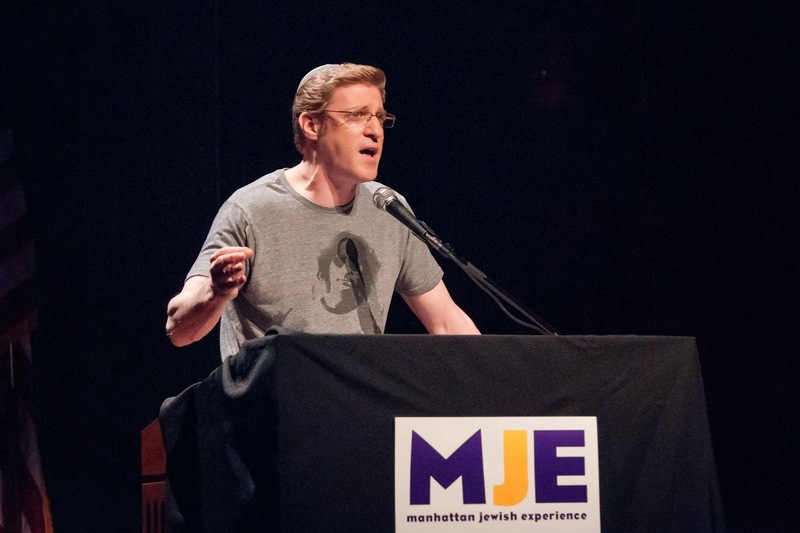 On Saturday Night, November 23 I had the honor of presenting Professor Alan Dershowitz to over 600 people as the keynote speaker at MJE’s Annual Ruth B. Wildes’ Memorial Event. We were fortunate to capture the evening on film and so if you were unable to attend you can still experience some of the magic of the night. I found much of what Professor Dershowitz said to be truly pertinent, insightful and inspiring. Enjoy! The PEW study confirmed what most of us already knew: despite our efforts to the contrary American Jews continue to assimilate and lose their Jewish identity. Intermarriage has risen to 58 percent and outside the orthodox community it’s up to 71 percent. Only 43 percent of American Jews have ever visited Israel and perhaps the most disturbing finding to me as a rabbi is that less and less of our people look upon their Judaism as a faith or a spiritual path for their personnel lives: 62 percent of those polled say being Jewish is mainly a matter of ancestry and culture, while just 15 percent say it is mainly a matter of religion. I feel like I confront this phenomenon every year when I visit my mother in law in Boynton Beach, Florida. She lives in a pleasant community which is approximately 90 percent Jewish, most of who are retirees from Long Island, Westchester or New Jersey. On each of my trips I’ve gotten to know a good number of the older people and although many are not observant most are extremely proud and identified with the Jewish community. It’s not uncommon to see many of the men wearing large chai necklaces or hearing woman speak to each other in Yiddish. But when I get into conversations about their children, there is this huge disconnect. One after the next I hear about how their children have assimilated in one way or the other. This one has intermarried, this one married a Jew but has no affiliation with anything Jewish. One older gentleman, a Holocaust survivor who I see at services three times a day, told me his 35 year old son who lives in New York intermarried and so his grandchildren are not Jewish. Another woman when she heard I direct MJE pleaded with me to reach out to her daughter who also lives in New York and regularly dates non-Jewish men. How is there such a gap between the parents who feel an almost visceral attachment to the Jewish people and their children who seem so far removed? Rabbi Joseph B. Soloveitchick tz”l pointed out that the first two biblical personalities to live in exile were Jacob and then later his son Joseph. Jacob was forced to run away from his brother Esau and spend the next twenty years living with his Uncle Laban away from his ancestral home in Israel. Joseph was also taken from his family and brought down to Egypt and spent the rest of his life in a foreign land outside of the land of Israel. However each of their experiences was radically different. Jacob spent his time in exile on the run and then in a difficult working situation with Laban whereas Joseph’s life in exile was characterized by prominence and affluence. But both remained committed to the monotheistic beliefs and traditions of their forbears. In doing so, Rabbi Soloveitchick taught, each was to model a different type of existence for us living in exile years later. Jacob’s life in exile was, in the words of the Rav, “to prove that the Torah is realizable in poverty and oppression, that the immigrant-no matter how hard he has to work for his livelihood, no matter how poor and oppressed he is-is capable, if he makes up his mind, to give devotion and loyalty to his ancestral tradition”. Joseph’s mission on the other hand continues Rabbi Soloveitchick, Joseph’s life “was to demonstrate that enormous success, unlimited riches, admiration, prominence and power are not in conflict with a saintly covenantal life”. Thus, both Jacob and Joseph’s life in exile teach us that no matter what kind of situation we found ourselves in, our Jewish identity can nonetheless be maintained. So what happened to our community here in the United States? How is it that parents who have such a strong Jewish identity and feeling for their own Judaism have been unable to transmit that to their own children? There are many answers but the most obvious has to do with Jewish education. To no fault of their own, most of our parents and grandparents never received a substantive Jewish education. Without that knowledge and specifically an understanding of the mitzvoth, their ability to transmit the values they so felt in their own home growing up was severely compromised. Mitzvoth are not merely rituals. They are vehicles through which we communicate and transmit our most cherished values to the next generation. Any parent knows that if they want their child to develop a certain value or belief they need to convey it in a concrete and tangible way. If you want to raise a child to be thoughtful, the parent needs to model that behavior by engaging in acts of kindness and charity. When a child sees his or her parents volunteering time for a cause or writing a check to an organization, that conveys the values of selflessness and giving. A few years back one of our donors called me to tell me his son was coming over to deliver his annual donation to MJE. I told him he didn’t have to bother sending over his son, that he could simply put the check in the mail, but he said, “I want my son to see that I’m giving some of my hard earned money away to charity so that one day he will do the same”. And I can tell you, he probably will. Children most often don’t listen to what their parents say, but they certainly notice what we do. If I want my kids to study Torah the last thing I should do is preach about it. However when they see their mother or father taking time out of their busy schedule to attend a class or open up a Jewish book, that goes a lot further than all the preaching in the world. Talk is cheap and kids know it and that’s why Torah is mitzvah-centered. Mitzvoth are actions and behaviors through which we communicate and transmit our most fundamental and most cherished values and beliefs. We convey our belief in God and in His creation of world by observing Shabbat. We transmit the importance of spending quality time with our family and community by shutting down the world around us and having festive meals. We transmit the Jewish value of gratitude by reciting blessings before and after we eat. We give over the Jewish trait of being open to others by engaging in hachnasat orchim and opening our homes to others. We convey our belief that God responds to His people’s cries for help by celebrating Passover and we transmit the belief that He gave us the Torah by observing Shavuot. We teach our children that God sustains us by going out of our homes and sitting in huts on Succot and we convey the power of speech and the idea that what we say in life matters is transmitted through the laws of lashon hara. The Jewish values of humility and modesty are expressed by the way we dress and speak and by the way present ourselves to others. On Chanukah we can sit around and talk about the Macabees and how they fought to preserve the Torah in the face of Greek persecution but if we want to ensure that that story lives on, that our children will one day tell the Chanukah story to their children then we need to light a candle. We need to perform a ritual. We need to engage in an activity. We need to do a mitzvah if we want to successfully transmit our beliefs and our values to the next generation. Otherwise much of our feelings and genuine sentiments for Judaism get lost in translation. Our generation has seen this first hand but our generation is also witness to an amazing return to mitzvoth and Jewish life which is truly inspiring and which should also give us great hope for the future. The Pew study may get us down but let’s not forget the many young men and women who have returned to a life of Torah and mitzvoth. And as more of us engage in these activities our most cherished beliefs and values are brought to life. We reveal not only what is in our hearts but also what has been in the hearts of our parents and grandparents but which was never given adequate expression. Mitzvoth will not only bring purpose and meaning to our lives but they will help ensure the survival of the Jewish people. May we merit to perform the mitzvoth and in so doing serve as a link in the chain of the transmission of our Torah and in the eternal values it embodies. too much for me not to try. and lectured throughout the country. serious scholar but I never really knew it for myself until I was about 18.
friends playing “bottle-cap soccer” in the auditorium) and I was blown away. and somehow a pertinent and relevant message for our generation emerged. came from a man so genuinely humble and free of ego or personal agenda. I so wanted the Rabbi to be proud of me. profound teachings not only had an impact on me but on my students as well. somehow benefit others. In fact that was the last thing I ever said to him. throat Rabbi Grunblatt responded: “Thank you…be mazliach…I’m very proud”. The recent NY Times article on the newly released PEW findings on Jewish continuity paints a bleak future for American Jewry. The study, among other findings, reported that nearly six in ten Jewish respondents (58%) who have gotten married since 2000, have married a non-Jewish spouse. The study also showed that only 20 percent of those who have intermarried are raising their children Jewish by religion. There are, I’m sure, many reasons for this worsening situation including a serious lack of Jewish education for most American Jews, a more than ever distracting world in which living any kind of religious life becomes more challenging, and many other contributing factors. However I believe there is another cause, which I have seen in my 20 years of outreach to the young and less affiliated: the sheer lack of joy or meaning that so many young Jews associate with Judaism. More often than not, the perception young people have of Judaism is of a faith filled with rules and restrictions which offers little or no joy or meaning in return. Like most synagogues, MJE has always drawn larger numbers for its Yom Kippur services than for Simchat Torah. This year however, for the very first time, we had approximately the same number of participants for both holidays. It took us 15 years but we did it. The same number of previously less affiliated 20’s/30’s who were willing to fast and pray with us on Yom Kippur returned to sing and dance with us on Simchat Torah. Young Jews desperately need to experience both the serious and lighter sides of Judaism. We can no longer allow our beloved faith to be marketed as a religion of guilt and restriction without even trying to present it for what it truly is: a path which can ultimately bring joy and meaning to contemporary life. And we must learn to properly articulate how the limitations Judaism does place on our lives are important in helping to create that more joyous and meaningful existence. The goal of our synagogues and Jewish institutions today must be to demonstrate this balance of reverence and joy; fealty to tradition with personnel meaning and relevance. Jewish educators need to be better trained to invest more explanation and inspiration into our prayer services and provide greater depth and insight as to how living a life of Torah can actually improve our lives and make us happier and more fulfilled people. Otherwise, for most American Jews, why bother? in the Golan and the mystical city of Tzfat (home to Kabbalah) to Jerusalem. We spent time visiting holy sites such as The Kotel (Wailing Wall), the City of David and the holy city of Hebron. And though this is the thirteenth consecutive year I have led this trip, with some of the same sites year after year, Israel never fails to inspire me. The breathtaking views we saw as we hiked the waterfalls in the Golan, the magical and mystical feeling of Tzfat as we walked the narrow passageways, and the extraordinary archeology and spirituality of Jerusalem filled us all, newcomer and veteran alike, with a sense of awe, history and purpose that no other “Jewish experience” can match. My wife, myself, and two MJE participants on the bus going to see the sights! per annum on the most ambitious outreach project ever– Birthright Israel. here for us to see, feel and touch. as we do each year to an army base and we had lunch with the soldiers. only for your service but for filling us with such pride”. Despite these wondrous experiences, I still must say that what I believe most profoundly impacts the Jewish “visitor” to Israel is the realness. As I said to our group at Shabbat Dinner as we sat overlooking the Kotel, so much of the Judaism we grew up with in America sounds like fairytales; sweet stories of our ancestors and heritage that may or may not be real or true at all. But when you come to Israel and you walk the streets, you touch the stones, you see the archeology and for the first time you are presented with some kind of real physical imagery of these stories. It all starts to come alive. As the old T-Shirts used to read: “Israel is Real”. Our history literally is this place. It’s not just a nice story. And so for the diaspora Jew, Israel is the ultimate authentication and validation of Jewish history and of our Jewish heritage, and THAT impacts us. That, my friends, is inspiring no matter how many times you see it.